The aims of this chapter are twofold: firstly, to explore the practical roles and ways in which consumers may exert control over the current food system and foster alternative food systems and, secondly, to examine how dietetic practitioners may better support their clients and how as a profession they may operate as expert leaders to foster the development of healthier food systems and communities. Our industrial food system is broken. Research and select a recent news item exposing an example of an industrial ‘food crime’. How has this incident come about and what factors may have contributed? What might be the motivation for industrial ‘food crimes’? What might be some public health ramification of ‘food crimes’? A Tale of Two Food Systems. Compare and contrast an example of the industrial food system (such as a large national supermarket chain or global food company) with an example of food democracy in practice (such as a local farmer’s market). What do you notice about the types of food sold in each example? What are the elements of ‘democracy’ in each system such as transparency of information and free and open discussion? Consider how easy it is to navigate each of these systems to purchase food if you had a chronic condition such as diabetes. Refers to the transnational food and beverage industry that is powerful, profit driven and focussed on the manufacture of ultra-processed foods with serious consequences for public health and the environment. “The emergence and growth of community-based agriculture and food production activities that not only meet consumer demands for fresh, safe, and locally produced foods but create jobs, encourage entrepreneurship, and strengthen community identity” (Lyson 1999, p. 2). Civic Dietetics is the application of dietetics to enhance public health by addressing food system structures, impacts and policies and their relationship to food choices (Wilkins et al. 2010). Activities encompassing economic deception and physical harms, issues of personal health and fraudulent activities such as food substitution, adulteration, and mis-representation (Croall 2007). Food democracy is the counterweight to the industrial food system. It can be considered a movement that seeks to create alternative food systems to improve health and transform passive consumers into active food citizens. A view of “nutrients as biochemical entities that are independent of cultural, environmental and bodily processes” (Scrinis 2008). 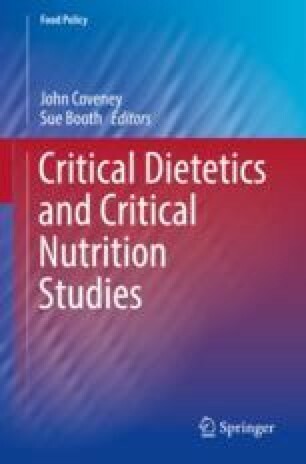 This chapter aligns with the proposed critical dietetics framework in two main ways. Firstly, an appreciation of multidisciplinary and trans-theoretical approaches to understanding food, health and people. Implicit in the very title of this chapter is a scene of interdisciplinary scholarship and a cross-section of theoretical approaches, which add to the richness of the examination. Starting with the term “food democracy”, we have the intersection of the world of food with that of political science. At first glance, these might at first seem unlikely companions, but as this chapter will explain, food democracy is quintessentially about consumers using democratic principles to regain some influence over the current industrial food system. In terms of broader food governance, food democracy is a way of decentralising control from “Big Food” and placing the locus of control back in the hands of the people. Here “Big Food” is taken to mean those large, often multinational, food companies which control the majority of food processes, food products and food choices in western jurisdictions but increasingly in other countries. The commodification of food and the resulting global food system is indeed a complex beast, with many players and actors. This chapter will delve into the realms of political science and explore the intersection of food with democratic principles, strong democracy and oppositional and constructivist politics. Secondly, this chapter subscribes to the belief that policy and practice positions should be socially just. According to Lang, a core premise of food democracy is the public good, namely, that ecological and public health will be improved by democratic process (Lang 2007). This chapter will also explore the roles for dietetic and nutrition practitioners to move beyond nutrient-based advice and encompass a broader vision of the whole food system and the greater public or food system ‘good’ when working with clients. This reorientation of dietetic practice and alignment with the values of food democracy is known as civic dietetics.